I don’t always use a pick when I play guitar. But I do keep an eye out for interesting new types of picks. Picks are great item to buy when you need something new but don’t have much money. You can always afford a few new picks. There are many design factors that distinguish picks and most of them have a fairly noticeable effect on the sound you get from your instrument. There are hundreds – maybe thousands of variations of the standard guitar pick. Most of these picks fall into a limited number of sizes and shapes. There’s no way I could cover – or would want to cover every pick made. Instead I’m going to discuss picks I’ve used or want to use that are mostly a bit different than the standard teardrop plastic pick. The exception is the first picks I (and probably you) ever used, below. Ignoring differences in color or other superficial design elements, the two main areas addressed by different picks are the different sounds they produce and your ability to hold and control them. Picks make a great inexpensive present for the guitar / banjo / mandolin player in your life. Consider picks and accessories for stocking stuffers or other holiday gifts. Fender or Gibson celluloid picks in Thin, Medium or Heavy and Teardrop or Triangular. When I first started playing guitar the only pick choices were triangular or teardrop shaped and thin, medium or heavy thickness (or stiffness – same thing). All the picks were celluloid plastic and most poorly emulated tortoiseshell. Most of my picks came from my local music store and were branded Gibson or Fender. My favorite flatpick for many years was a Fender thin teardrop. At some point I switched to heavier picks but still like the teardrop shaped picks. The zero gravity pick slips onto your finger with the pick portion held far enough away and at an angle so you can hold it between your thumb and first finger – just like a normal pick. The zero gravity comes in if you let go. The pick doesn’t fall to the floor but remains within your fingers grasp. You need to finger pick a solo then go back to using a pick – this is one way to do that. It never really felt comfortable to me but it might work for you. I just discovered these picks. They are a specialty pick – I doubt you would want to use them all of the time. They are teardrop shaped but much thicker than most picks because they are made from rubber. They come in several thicknesses and degrees of hardness. I had read that these produce a sound similar to playing with your thumb. I’d say it’s more of a semi-muted tone. Still, it is a different sound than standard picks. If you want to try a softer sound, try these. I find I like them on mandolin – though again, only occasionally (like after my wife has gone to bed). Note that Wedgie picks have a sculpted depression where your thumb goes. It makes them comfortable to hold. Wedgie also makes hard plastic picks which also have molded thumb depressions. These come in nylon, Delrin and standard plastic, each in a number of widths. I’ve never tried this pick but it fits the goal of a pick that is less likely to be slip out of your fingers. This is the Everly Star Pick. My current favorite pick is the Dunlop Gator Grip pick in a 1.14 mm thickness. Another Dunlop pick I like is the Dunlop JazzTone 207. This pick has a slightly different pick from the stanadard teardrop shape. Besides being easy to grip the point is more rounded which produces a tone I can best describe as more mellow. Big Stubby picks from Dunlop are hard picks in either teardrop or triangular shapes. They have a molded depression that has a rougher surface for your thumb to keep a grip on the pick. I’ve tried the triangular picks in Lexan plastic. It is a very hard plastic pick with a relatively sharp point and produces a very different sound than the Dunlop JazzTone picks. The tone produced by the pick, as well as the feel, doesn’t suite me as much as the JazzTone. But we’re all different and you might love it. Based on the number of picks with sharp points versus more rounded points, I guess my preference is in the minority. Dave Control Picks have a unique design where an area between the point and the top is thinner and more flexible. The theory is that you can control whether the pick feels like a “thin” pick or a “hard” pick by where you hold it. Grab it near the tip and the pick is stiffer. Hold it near the edge opposite the point and it is more flexible. I own some Dava control picks and the textured surface is easy to grip. I like the sound from the pick. But I have difficulty gripping the pick differently than I’ve been doing for 50 years. I’ve never tried these but they look like an interesting combination of materials designed to give you a better grip on your pick. Once upon a time, before we humans worried about animal extinctions, picks (and pickguards) were made from tortoiseshell. I’m glad we worry about such things now. Although you might think all modern picks are made from plastics, you can in fact find picks made of unusual and natural materials. 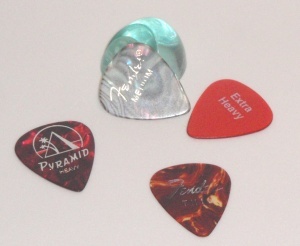 Clayton has a number of different materials for picks beyond plastic. Their Exotic collection includes teardrop shaped picks made from Horn, Coconut Shell, Blond Wood and Sheesham Wood. I’ve never tried any of these but I’m curious and would like to try them sometime.